More often than not when I look back at a project I have been involved in or an event we have produced as a company, I can look at who engaged in it or attended as an audience and I can invariably classify it as ‘the usual suspects’. By that I mean despite our best efforts to shout out about what the offer is and that it is open to all, we have generally succeeded in reaching only those we already knew, barring a few new faces, and in many ways repeating processes and systems we have used before with familiar partners. For those unfamiliar with the work, 11MRTD is an inspiring photography collection and series of short films, commissioned by People Dancing, that reimagine famous dance scenes from the movies. It has generated interest in how work for and by Deaf and disabled people is supported and presented within society. My own organisation, TIN Arts, is a dance development company, based in Durham, that engages people with and without a disability across the North of England. We work with people of all ages and, in 2017-18, two of every three participants who danced with us had a learning disability or autism. Our work stretches from classes for those taking their first steps in dance in our studio through to supporting our Artist in Residence, Becki Parker – a dancer with Autism, to present her work ‘Hunting for the Unicorn,’ at the renowned outdoor arts festival Fira Tarrega, in Spain. Having seen the exhibition at the Southbank Centre in London, I was sure 11MRTD would appeal to all those we knew who loved dancing and also their friends and families. But I was determined to utilise the power of Sean Goldthorpe’s 11MRTD images to greater use. Yes, dance is the heart of the exhibition but here was a collection of work that could appeal to far more people than those we connected with through dance. What about those with a passion for photography or regular gallery ‘goers’? We had a chance to stretch beyond the usual suspects. The criteria for placing the exhibition felt quite straight forward. First of all, find a venue -central to Durham, open to the public with good ‘high street’ visibility and footfall. I was keen that the work connected with the ‘mainstream’, that you could happen across it and that it would pull you in. To me, the exhibition was for everyone and not for a select cultural few. I firmly believed that Sean Goldthorpe’s photography and the films should be presented, received and recognized for the great art that it was. For quite a few years, TIN Arts has hired the Gala Theatre in Durham for an annual event called Best Foot Forward. 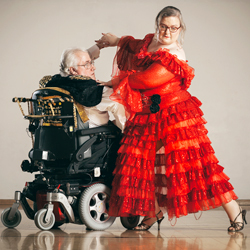 It’s a celebration of dance and arts work created and performed by artists with a disability. This ticked all of the ‘criteria’ boxes for 11 MRTD and, like us, The Gala was keen to form more partnerships with local ‘like-minded’ organisations, to reach out to new audiences and communities. And the venue was bang in the middle of Durham City with a new space recently made available that, with a lick of paint and a bit of thought, could be a perfect exhibition space. Meeting set-up. Conversation had. Partner on board. Tick. But the resources (for resources read funding) attached to the exhibition were limited and to make the kind of impact we wanted to make -a big one - we needed more resource. Not long before my hunt for partners had begun I had coincidentally been in conversation with the chief executive of a local charity who was looking for innovative, exciting new ways to raise the profile of its organisation and its work. Meeting set-up. Conversation (or actually quite a few conversations) had. Partner on board. Tick. So now we had a great central partner venue and a generous partner supporter in place. Fast forward through the usual processes: the branding, creating marketing print, drafting copy, press releases and so on and the point of mounting the exhibition had arrived! If there is one thing I have learnt in my 20 years in the cultural sector, it’s do what you do well and get others to do what they do well – don’t try and be something you’re not! Lucy Jenkins, a local art curator, came on board and brought an amazing new insight into a whole world I didn’t know existed – the art of curating. Our underpinning principle was to make sure that anybody entering the exhibition couldn’t help but be moved and inspired by what they saw. Lucy helped us to present Great Art in the best way possible. The ‘potential’ to reach out was becoming ever more real. Yet there was more we could do. We looked further at what was happening in the theatre in terms of its programming and what could be done to drive audiences towards the work. We planned and delivered ‘see and do’ workshops for local school and community groups, where a dance workshop would follow a visit to the exhibition. We organised a ‘free to view’ screening of the iconic film ‘Singin’ in the Rain’ for anyone and anybody to attend (including a visit to the exhibition). Whatever we could do to share the news that the exhibition was here in Durham, we did it. You didn’t need to be a dancer or have a love of dance to see the beauty within the exhibition. You didn’t need to have a friend who danced or a relation with a disability to connect with the exhibition and the people featured in the work. The images speak for themselves. Popular, iconic films reimagined by people who love to dance. It’s a very simple thing. It’s a very appealing thing. And our attendance numbers surpassed all of our expectations. But 11MRTD did so much more than get people through the door. It’s value to our own development at TIN Arts and to that of our partners has been considerable. As a partnership, we challenged ourselves to reach out further than to our usual suspects, to think outside the bubble… and we did this. The legacy of all this lives on, not just for TIN Arts but the whole partnership. Our working relationships have been strengthened as we’ve worked collectively, popping bubbles where we see them and getting beyond those familiar faces. Actually, the 11 MRTD collection set the tone for our own journey together, encouraging us to think beyond, to reimagine a different way, to challenge convention. Then, to do it well.